Emma is a secondary school English teacher. She has also worked as a news reporter, an avocado picker and the person who punches holes into filofax paper. She recently graduated with distinction from Bath Spa University’s MA in Writing For Young People. She lives in the Somerset hills with her husband and two terriers. She is published by Faber and Faber. 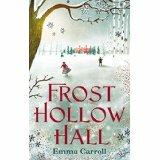 Frost Hollow Hall won The North East Book Award 2013 and the Hillingdon Book of the Year Award. It was longlisted for the Brandford Boase Award 2014 and was shortlisted for the BASH award 2015. It was a Pick of the Year for Redhouse Books. 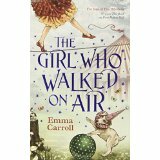 The Girl Who Walked on Air has been nominated for the 2015 Carnegie Medal. Chat to Emma on Twitter @emmac2603. You can also find her at emmacarrollauthor.wordpress.com. 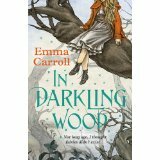 In Darkling Wood (July 2015): ‘You’re telling me there are fairies in this wood?’ When Alice’s brother gets a longed-for chance for a heart transplant, Alice is suddenly bundled off to her estranged grandmother’s house. There’s nothing good about staying with Nell, except for the beautiful Darkling Wood at the end of her garden – but Nell wants to have it cut down. Alice feels at home there, at peace, and even finds a friend, Flo. But Flo doesn’t seem to go to the local school and no one in town has heard of a girl with that name. When Flo shows Alice the surprising secrets of Darkling Wood, Alice starts to wonder, what is real? And can she find out in time to save the wood from destruction?